Although it all seems to be happening at once, it's normal for the Asia-Pacific region to have frequent earthquake and volcanic activity. These volcanoes are part of the Pacific "Ring of Fire", a horseshoe-shaped belt of earthquakes and volcanoes that runs for some 40,000km, roughly around the edge of the Pacific Ocean. 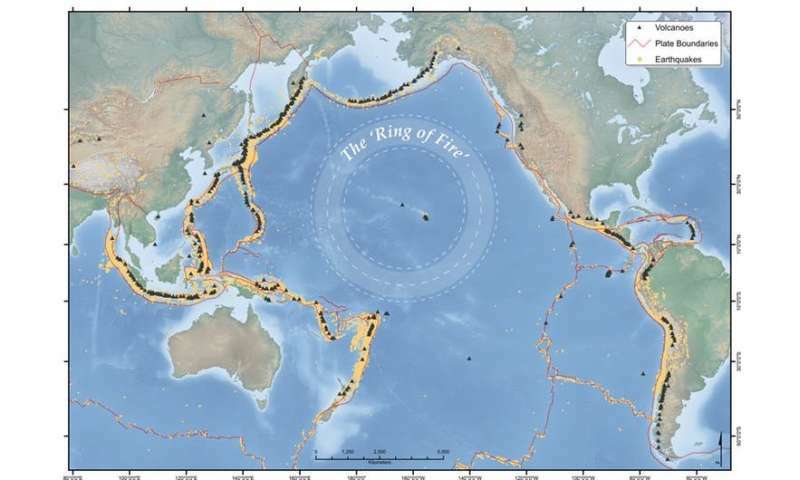 The Ring stretches from South America, up to North America and across the Bering straight, and down through Japan, the Philippines, Papua New Guinea, Vanuatu and New Zealand. It generates around 90% of the world's earthquakes and contains 75% of its active volcanoes. Mount Agung in Bali has been highly scrutinised for the past few months, largely because of Bali's popularity as a tourist destination. Since then we've seen frequent explosive eruptions emitting gas, steam and volcanic ash reaching thousands of metres above the volcano. In the evening of January 19 an explosion of fire (known as a "strombolian" eruption) ejected glowing rocks up to 1km from the crater. The alert level remains at the highest level, with an exclusion zone in place. There have been very few issues for tourists visiting Bali so far, apart from a temporary closure of Denpasar airport in late November 2017. However, thousands of Agung's local residents are still displaced from their homes, with many still stationed in evacuation centres. It remains uncertain when those living closest will be able to return home. Many evacuated pregnant women have given birth to babies since leaving their homes in places such as the Bumi Sehat's community health center and birthing clinic in Ubud, which relies on donations to keep running. As a mother of a one-year-old and a three-year-old, I can't imagine having a newborn baby and not being in the comfort of my own home. Eruptions have produced ash plumes reaching as high as 11km into the atmosphere, as well as ash fall and lava flows. There have also been volcanic mudflows ("lahars") and fast-moving, hot flows of gas, ash and rock fragments ("pyroclastic flows"), which have killed 25 people. Mayon, around 330km southeast of Manila, is a picture-perfect volcano with its steep-sided conical cone, typical of stratovolcanoes. It is one of the most active volcanoes in the Philippines, with 24 confirmed eruptive periods in the past 100 years. Mayon's most violent eruption in 1814 killed more than 1,200 people and destroyed several towns. Until January 2018, when it began erupting, I hadn't heard of Kadovar. It's a 2km-wide, 365m-high emergent summit of a stratovolcano off the coast of Papua New Guinea. Activity began on January 5, 2018, with rising plumes of ash and steam from the volcano. The island's inhabitants, some literally living on the crater rim, began evacuating at that time. People were initially taken by boat to neighbouring Blup Blup island but then to the mainland along with other nearby islanders, due to the close proximity of the eruption and logistics of providing people with supplies. The Rabaul Volcano Observatory reported that activity significantly escalated on January 12, with a large explosive eruption and volcanic rocks ejected to the south. Large amounts of sulfur dioxide have been detected since January 8, and continue to be released along with ash and steam plumes. A lava "dome" has been observed glowing at night. On January 23, 2018, an eruption occurred at Kusatsu-Shirane volcano without any prior warning, catching Japan's Meteorological Agency and volcanic experts, not to mention the skiers on the volcano, by surprise. According to agency's volcanology division, there had been no volcanic activity at the apparent site of the eruption (Kagamiike crater), for about 3,000 years. Japan has more than 100 active volcanoes, with many monitored 24/7 by Japan's Meteorological Agency. Keeping watch on the world's volcanoes is a big job for the local volcanic agencies. This is particularly true when volcanoes erupt for the first time in history (Kadovar is a good example) or there were no warning signals before eruption, as at Kusatsu-Shirane.